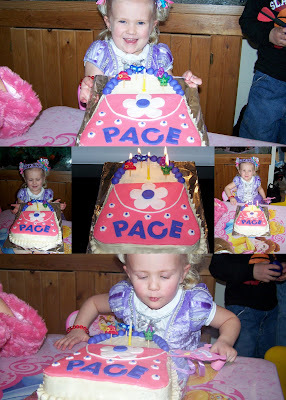 Pace chose a purse for her Birthday Cake. My great friend Dierdra came over and helped me finish it for her party! It is my/our absolute favorite! Thank you for all your help Dierdra! Pace and everyone LOVED it!! It was so...CUTE to see Pace's friends join in the fun of it all, and show up in their "Fanciest Attire". (Pace thought it was the greatest) They were quite Entertaining dressed up in their dresses, some in heels, necklaces, pretty hair bows, tiaras, fake earrings, and one or 2 even wore mascara and/or lipstick. I have to say they were all pretty "stinkin' CUTE!"! 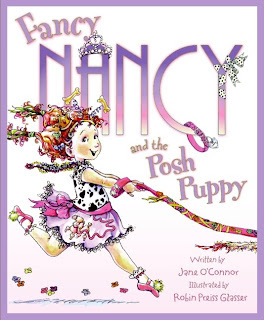 Just in case you don’t know about Fancy Nancy, it’s a series of children’s book, written by Jane O’Connor & illustrated by Robin Preiss. I'm Nancy and I like everything Fancy! 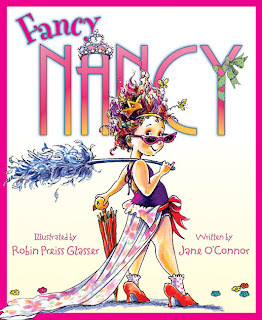 The first book in the series is Fancy Nancy. 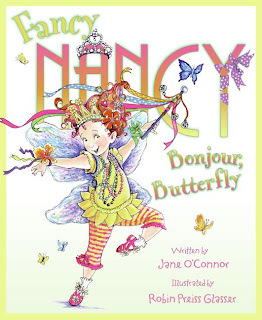 Our other favorites include Fancy Nancy- Bonjour Butterfly,and Fancy Nancy & The Posh Puppy. The little girl in the book, Nancy, has to have everything fancy. 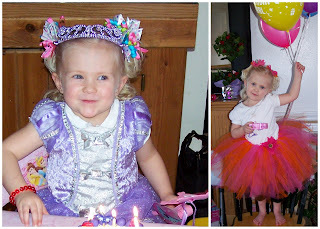 She loves all kinds of fancy stuff like feather boas, glitter, crowns, bright & bold colors. She’s so unlike her family who Nancy thinks are extra plain. Nancy, who believes that more is ALWAYS better when it comes to being fancy. From the top of her tiara down to her sparkly studded shoes, Nancy is determined to teach her family a thing or two about being fancy. 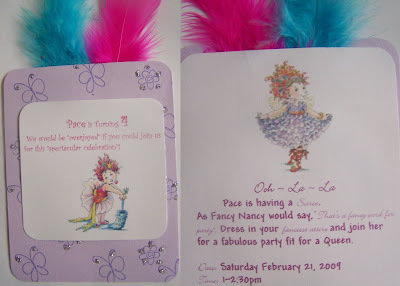 Since "Fancy Nancy" is a fad of Pace's right now, for her 4th Birthday, she wanted to have a Fancy Nancy themed Birthday "Soiree" (that's fancy for party). It took me a day or two to come up with a made invite, and of course they were all "decked out" with feathers and glitter! Pace LOVED them! She invited her cute little friends from sunbeams, school, and closest friends. They too had to come dressed in their "fanciest attire" as Nancy would say. Our little "fancy Nancy". Isn't the orange tutu and matching hair bows adorable, one of my good friends made it for Pace. My Jewelry Website! Check It Out!! !